DHTMLX Scheduler .NET provides simple drag-and-drop user experience and intuitive interface, allowing you to quickly add an Ajax-enabled, interactive event/booking calendar or car rental to your ASP.NET apps. View the demos or download the trial version to see Scheduler .NET in action. In addition to attractive design, this ASP.NET scheduler supports the most required features: multiple views, recurring events, customizable appearance and event dialog boxes, export to PDF, iCal, Outlook and Google Calendar. If you want to request or suggest a feature, you can use this form. You can display your calendar events in Day, Week, Month, Year, and Agenda views. Multiple Resource Views(units, timeline) Updated! You can display events for several resources (e.g. employees, office locations, rooms) on a calendar page using Units View or place them in a horizontal Timeline View. You can arrange data loaded from different resources in a grid and sort it by type. 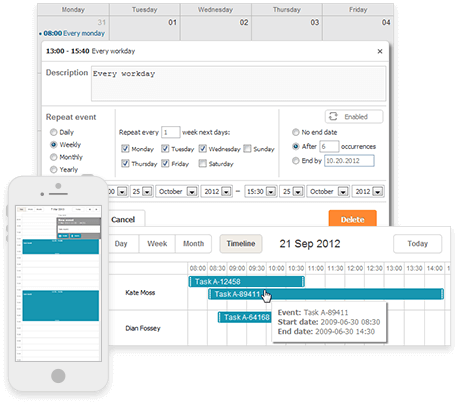 Calendar events overlapping in time can be displayed in cascades in the week view. Multi-day view allows displaying events in daily and weekly views. You can create multiple scheduler instances with different views on one page. Date picker allows easy navigation through days, months and years. You can customize the calendar look and feel. There are four nice-looking skins: classic, glossy, terrace and flat. Wide details form and custom display of events are supported. 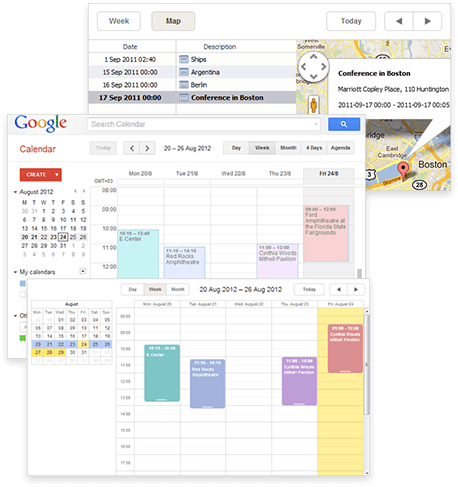 Calendar times sections can be marked with color or blocked to prevent users from making entries. A highlight pointer helps add new events. Moreover, you can create events upon a click and highlight the position of an event on the time-scale. You can hide unnecessary week days or hours in the horizontal time scale. Or you can add extra week days to the calendar view. This ASP.NET calendar comes with some accessibility features. 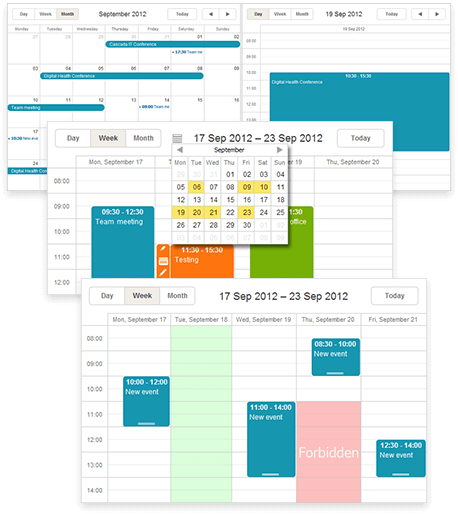 In particular, scheduler.NET provides WAI-ARIA support, high-contrast skins and keyboard navigation. Integration with Google Calendar via Google Calendar API v3 allows you to synchronize events between DHTMLX Scheduler Calendar and Google Calendar. Scheduler .NET is integrated with Google Maps allowing to locate your events on the map. Calendar events can be exported to pdf or ical. With Scheduler .NET calendar data can be imported/exported to/from Outlook Calendar. You can configure your events to repeat on a daily, weekly, monthly or yearly basis and define the editing mode. Calendar events can be filtered by type, occurrence, time, location and other parameters. You can easily convert server side dates from UTC to your local time zone and backwards when data are sent to the server. You can set custom tooltips with event details, popping up when you hover over an event. Scheduler .NET is optimized for touch screens, including tablets, touch screen monitors and smartphones running iOS, Android and Windows 8. Live update allows real-time collaborative scheduling and editing of scheduler events. All updates become visible to other scheduler users once they are made. 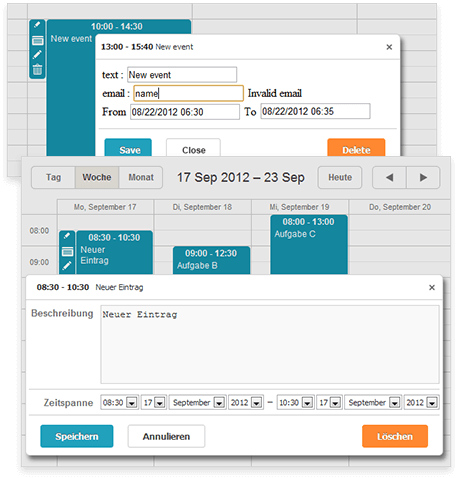 The scheduler interface can be localized to German, French, Italian, Portuguese, Turkish, Spanish, Japanese, Russian, etc. Scheduler .NET allows adding user inputs validation using DataAnnotation engine. With auto-save the details form closes up automatically when you click outside the form. While editing an event auto-update refreshes the entire calendar view. By default, only the edited event is updated. This feature is applicable in cases when automatic resizing of event boxes is required. 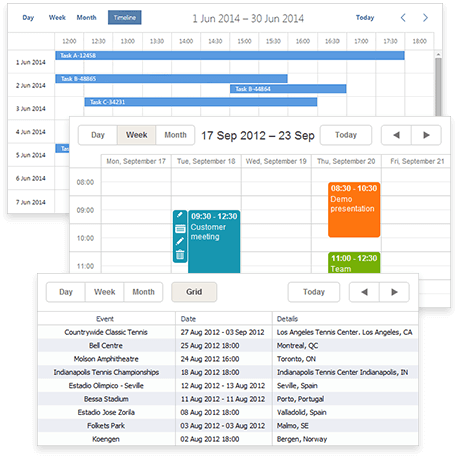 Scheduler .NET 3.2 is fully compatible with Bootstrap - HTML5 and CSS3 framework.